In the spring of 2000, Fulton County Sheriff's Deputy Ricky Kinchen and fellow Deputy Aldranon English went to serve a warrant in downtown Atlanta. Both Kinchen and English were African-American. Kinchen had graduated Morris Brown College, a historically black college that had been founded in 1881 and named after one of the founders of the African Methodist Episcopal Church. He had spent almost a decade serving the public in his current job and was married to Sherese Kinchen and had two children. At his killer's trial, Sherese testified that, "When Ricky was killed, I lost a part of myself. Ricky was not only my husband, he was my friend for 18 years. He was my confidant and my rock, and now he's gone." When Kinchen and English were approaching him, Brown was known as Imam Al-Amin, a Muslim religious leader who headed the Community Mosque and was a key figure in the National Ummah. He was no less of a terrorist for it. Al-Amin opened fire with a rifle on the two African-American law enforcement officers. Deputy Aldranon English was wounded and he stumbled to a nearby field to save his life. Deputy Kinchen was shot and fell. Al-Amin ran out of bullets, took a handgun from his black Mercedes, pointed it at the fallen African-American officer as he lay dying and shot him between the legs three times. Deputy English survived the attack. Later he would break down in tears on the stand as he described the murder of his partner. Defense lawyers for Al-Amin worked to rig the jury, removing anyone who disliked the violent racist Black Panthers hate group that Al-Amin, in his former life as H Rap Brown, had been associated with. They ended up with a jury of six black men, three black women, two white women and one Hispanic woman. The jury, including the six black men and three black women, found Al-Amin guilty as hell of the murder of an African-American police officer. Al-Amin and his two wives, the younger of whom was a teenager when they were married, who lived in houses three miles apart from each other, frowned as the verdict was read. Al-Amin was sentenced to life in prison. There would be no parole. Outside the church where Deputy Ricky Kinchen was buried, the line of police cruisers stretched for miles as officers paid tribute to a fallen brother. His casket, covered in the flag, was carried out to honor and glory. 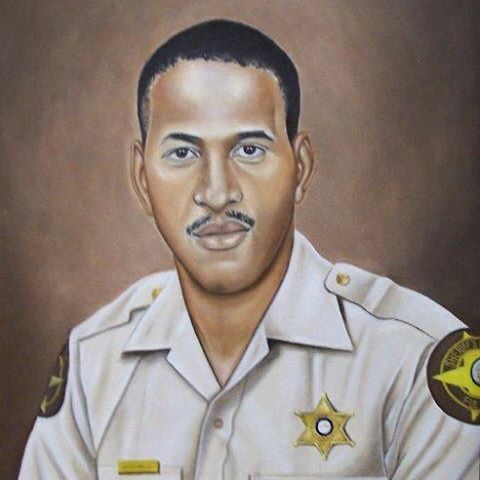 If there had been any justice, Deputy Kinchen would be remembered as a hero. Instead Al-Amin has become a martyr among black nationalists, including among the latest incarnation of the racist movement, Black Lives Matter. The recently released Black Lives Matter policy agenda calls for freeing a number of cop killers, including the murderer of Deputy Ricky Kinchen. Al-Amin is one of Black Lives Matter’s heroes. It doesn’t matter at all that he took a black life. Black lives don’t matter to Black Lives Matter. Black Nationalist terrorism does. The racist hate group describes the murderers of black and white police officers as “political prisoners”. It demands the removal of Assata Shakur, a particular icon of Black Lives Matter, from "international terrorist lists" and an end to the bounty for the capture of the fugitive who helped murder New Jersey State Trooper Werner Foerster. Black Lives Matter also agitates on behalf of Kamau Sadiki, formerly known as Freddie Hilton, Assatu Shakur’s ex-boyfriend. Hilton had been busted for the sexual abuse of his girlfriend’s 12-year-old daughter. The Black Nationalist icon had allegedly molested the little girl for seven years. Eager to get out of trouble, he began talking to the police and it didn’t take them long to connect him to the murder of Officer James Green who had been killed by Hilton on orders from a superior in the Black Liberation Army. If the life of Officer James Green doesn’t matter to Black Lives Matter, perhaps the life of that little girl should. But it clearly doesn’t. Finally Black Lives Matter’s policy agenda speaks out for the murderers of Sergeant John V. Young. Young was killed with a shotgun blast inside a police station by Black Nationalist terrorists who were also involved in the attempted murders of seven police officers. One of their vilest crimes was the bombing of St. Brendan’s Church where the funeral of Patrolman Harold Hamilton had been taking place. Hamilton’s three little children were nearby when the bomb, filled with nails and screws, went off. If all had gone off according to plan, the bomb would have exploded as the casket with the fallen officer was being carried past it. But the timing was off and no one was hurt. But not for lack of trying. "To the violent and the criminal our efforts to halt this kind of lawlessness will be condemned as acts of oppression," Governor Ronald Reagan declared. "Let them call it what they will. I'm unable to hear the whimper of the criminal above the cry of the victim and the weeping of his widow and children." Black Lives Matter still calls it oppression. It demands that we hear the whimper of the cop killer. It is no coincidence that the cop killers that Black Lives Matter is agitating for were associated with the Black Liberation Army. Or that the hate group traffics in rhetoric about police genocide that is ominously similar to those of the racist killers and terrorists that it defends. Black Lives Matter does not care about the lives of black people or of anyone else. It is a terrorist organization that seeks power through terror. It plays the victim as cover for its abuses. The life of Ricky Kinchen has no value or worth to Black Lives Matter. It cares nothing about the pain that the father of two felt when Al-Amin stood over him, pointed a gun and pulled the trigger for no other reason than to torture him and to cause a dying officer more unspeakable pain. We must never forget that this is what Black Lives Matter supports. We must never forget that these are their heroes and their role models. We must never forget that the murder of police officers associated with Black Lives Matter campaigns is not an accident, but a design. That is why Black Lives Matter complains about the execution of Black Nationalist terrorist Micah X. Johnson after his murder of 5 Dallas police officers in its policy agenda. Whether it’s decades ago or today, Black Lives Matter supports the murderers of police officers. We have seen such horrifying acts of brutal slaughter. After a fair trial and conviction, the killer should be seen as deserving his lawful punishment. How can he credibly be portrayed as a folk hero and victim? Unfortunately, our balls-less fearless leader is all in favor of what blm represents. It may appear that obama's only regret is that he is a little too old to participate with the action squads, but the truth is he has always been the type to hang in the back and encourage the useful idiots to do the dirty work. Black Lives Matter is agitprop. It is also a further Leftist obscurity of the English language (as Orwell so presciently predicted) because it is clear that black lives don't matter to BLM. Getting Lefty candidates elected is the purpose of their "movement." Any misfortune along the way is collateral damage. Hillary wants to forgive $1.7 trillion in student loans. Think of what that capital could do for fighting crime in America's inner cities. Black lives don't matter -- political influence-peddling does. Whoever takes the life of anyone should be judged by are they perpetrators or defenders. Perpetrators are murderers, and the killer of the perpetrator is defending life. Yet, if one takes a life, that is an act we must all realize should be a literal last resort, and means the end of possibilities for the deceased. In other words, it is a very very heavy act. Black Lives Matter is dedicated not to improving the lives of blacks but instead to the left wing ideal of creating a socialist police state in America. To bring that about, the Left and BLM attack the rule of law, crucial to a free country, by criticizing the police for 'racism' in dealing with the black community. They disguise their attacks by hurling accusations of 'racism' and 'dominance by white males' at anyone who disagrees with them and their political goals, ranting about mistreatment of blacks by the police, and spouting cheap malevolent multiculturalist nonsense, the drift of which is that Western culture with its traditions of freedom and individual rights is not vastly morally superior to primitive savage murderous enslaving cultures of the third world. We should treat BLM with the contempt which they richly deserve. Islam seems to be a common thread through the black liberation movement these days, but maybe I'm just imagining it. Bad killing good. Worst killing best. Vicious circle drawing society down into the abyss. BLM leaders should all be in jail or executed for the HIGH TREASON and FELONY INCITERS they are. All lives matter, and we really shouldn't need to say it and make it a slogan.